Driving on the roads with expired plates is illegal in Indiana, but also parking a car at your home with expired plates or no license plate at all is also illegal in Indianapolis. INDIANAPOLIS — Driving on the roads with expired plates is illegal in Indiana, but did you know that parking a car at your home with expired no license plate is also illegal in Indianapolis? Indianapolis City Code says vehicles with expired plates or no plates at all are considered inoperable vehicles, and aren't allowed to be stored on public or private property. Inoperable and abandoned vehicles are regulated by the motor vehicle ordinance, according to the city. But who enforces that city ordinance? 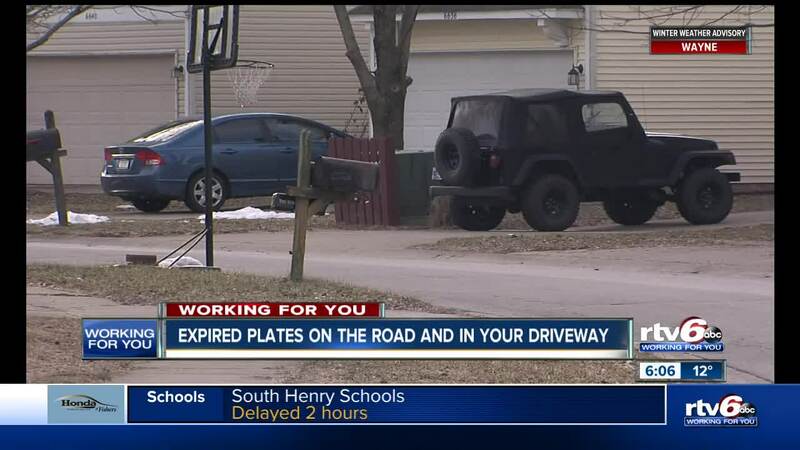 In the Buck Creek Village Neighborhood on Indianapolis' southwest side, RTV6 found several expired license plates on vehicles throughout the neighborhood, including a temporary plate that expired in January of 2018. "The vast majority of our neighborhood follows the law, just like the majority of people everywhere," said Chris Brand, the President of the Buck Creek Village Neighborhood homeowners association. Brand says their neighborhood bylaws also prohibits vehicles with no license plates or expired tags. "I'm not reporting these people the first time I see the violation," Brand said. "I'm sending letters first." According to Brand, a number of people are still parking cars with expired tags on their lots and even driving them, so he turned to the city for help. Brand told Call 6's Paris Lewbel that he called the non-emergency dispatch number, but was told it wasn't a police matter and to call the Mayor's Action Center. He said he called the MAC and said that didn't go anywhere either. After multiple calls, he was told they weren't responsible and it was a zoning issue that they couldn't do anything about. Code Inspectors from the city's Department of Business and Neighborhood Services are responsible for inspecting inoperable vehicles on both both public and private property across Indianapolis. It's an issue that affects many neighborhoods citywide, but Call 6 has learned that the city's code is rarely enforced. We went to the city agency to find out why more action isn't being taken. Code Inspectors do go check for inoperable vehicles, according to Brandi Pahl, the Chief Communications Officer at the Department of Business and Neighborhood Services. Pahl explained the process and says inspectors first go out and perform an initial inspection, if they find an issue, they must go out four more times to see if the resident comes into compliance with the city code, either by removing the vehicle or getting valid plates and tags for the vehicle. If the inspector can't find the car, the case is closed. If the issue is still there after the fourth compliance inspection, the fifth time the city comes out to the property, the city than can move forward with legal action. They can forcefully remove the vehicle or fine the resident. "It is important to note that getting property owners and tenants in compliance with the ordinances is our number one priority. We give property owners and tenants time to correct the violations on their own," Pahl siad. "If progress can be seen, we will often work with the property owners and tenants to allow them more time to come into compliance." We asked the city about the violations in the Buck Creek Village Neighborhood and they tell us in 2018 they did investigate 16 complaints about vehicles having expired tags or no plates. They said although they did find violations multiple times, in all the instances they never were able to find them for a fifth time and all the cases were closed. The city did tell us they could simply be because someone was out driving the car and it wasn't home at the time. If you have an inoperable vehicle in your neighborhood, report it to the Mayor's Action Center at (317) 327-4MAC or at the MAC's RequestIndy website .